more cockpit length and wider doors. I think I am on to something, but the shape of a coupe with the top removed just isn't quite right either. I basically like '29's, I think they have some really cute features, but they need some help, so here we are. Now I'm getting into the ride (on the left). 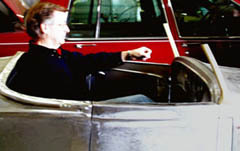 The front edge of the door has been moved one inch to the rear, and the doors are a good two inches longer for a total of three additional inches of driver comfort. Note the custom dash on the right. 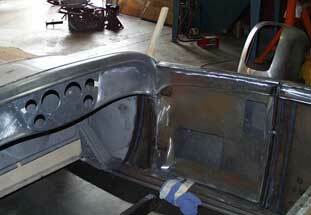 Also we are not finished yet with the top edge of the door leading into the windshield post and cowl. I must be checking the speedometer, a little over 200 it says. Notice how the corners of the doors and deck lid have been rounded. 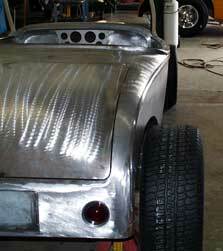 The area between the front edge of the deck lid and back of the cowl now rise gently, no more flat panel. 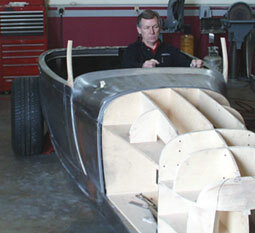 At the bottom of the body, the frame will be reshaped to match the body. There will be a bodyline, but no overhang of the frame. Where are we going with this you ask? This car was developed by ATR and my good friend Harry Nicks. 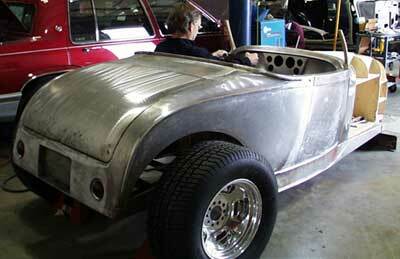 It has been completed and had features in Street Rod Builder and torsion bar chassis detail article in Rod & Custom. Harry owns what may be the best kept hot rodding secret in Southern California. Contact Harry directly at: Nicks Old Car Specialty (909)798-1078. If you need a project done in metal give him a call.